Fellow marketers, I’ve been away for quite some time, focusing on some quality time without a computer (can you believe that?). I’m back, energized and ready to roll! I wanted to open it up to a new topic, here on Marketing 2.0, that is keeping my team busy for quite some time now: Enterprise 2.0. I’m sure you heard the buzz word before and maybe took a more in depth look at it. But I guess for those working in the IT industry and already involved in the Web 2.0 phenomena it’s the natural question to ask ourselves: what are the Web 2.0 attributes, social behaviors and underpinning technologies bringing to the enterprise? Is this only about taking blogs, wikis, RSS feeds and what have you, to your intranet? Or is it a more profound paradigm shift that will finally unleash the expected new enterprise species of the new millennium? You bet some of our gurus have been writing and pitching about it as the yearly Enterprise 2.0 conference can attest. Let’s hear some of the most visible. First of all, spend about 10mn to view this introductory video on ZDNet Web 2.0 for the enterprise. If you’re now thrilled and ready to spend 40mn or so, listen to Don’s pitch at the Enteprise 2.0 conference. It’s fun and enlightening. 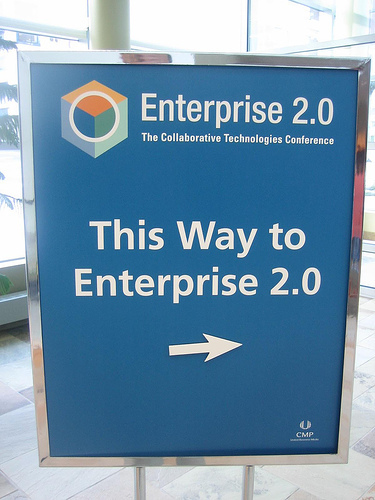 Finally, and to close this first post about Enterprise 2.0, I found Fred Cavazza’s in depth post What is Enterprise 2.0? about it very useful to provide a solid 360 view. Stay tuned for more, Enterprise 2.0 is here to stay. 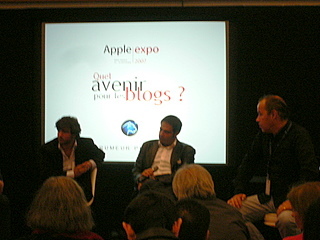 Interesting as well is the popularity of blogs compared with traditional or media websites. During Q3 2006 there were only 12 blogs in the Top 100 most popular sites, in Q4 this is rising to 22. Even more, the audience tends to distinguish less and less blogs from official media sites as NYTimes and considers blogs as news providers. Is this the rise of Press 2.0? Enjoy and spread the numbers out there. Blogs should be part of your Marketing 2.0 dashboard. As the blogger platform doesn’t offer by default the ability to create tags cloud, I was looking for a simple way to just insert one from a third party. I like tags cloud a lot, it gives you in an eye blink a feel for what a blog is about. I’m now using ZoomClouds for several days and it seems to work just fine. Go ahead a create one, it’ll provide some additional metrics about what topics your blog readers take a look at. On top of it, it generates automatically tags for you on top of the labels you have created. Do you measure buzz about your brand on blogs? Most of you are probably already using Technorati trends and Google trends to have a feel for it and be able to create nice slides for your management. Again, if you don’t, check them out right now. I wanted to highlight this very interesting set of tools coming from Nielsen BuzzMetrics: Trend Search, Featured Trends, Conversation Tracker, BlogPulse Profiles. This is totally dedicated to the blog universe and very easy to customize. The Key People analysis, which has its own RSS feed, clearly shows who’s making the buzz among top U.S. personalities (John Kerry took the front seat on Oct. 31st from rank 25, you must surely know why). So now that we have some measuring tools ramping up to help us make our point, let’s make Marketing 2.0 a measured integrated marketing approach. A question remains though, how do you translate positive buzz measurement into actual opportunities or revenue increase? I guess I’ll have to work on it quite rapidly. In the meantime, enjoy your week-end fellow marketers.